Are these shoulder meant to be hidden from the Appearances tab? Can't find them on the list and it doesn't display anywhere as to where they drop. I assume Xavius but its not on his loot table. This is just an assumption. Please confirm it, if someone gets it from the chest. Obviously linked to Xavius. These have not appeared in-game yet as of the time of this post. Can confirm that these drop from Heroic Xavius. Just received them on my Mistweave Monk. Just got these tonight off Heroic Xavius, 865 upgraded with a socket. Question - are these a regular drop or personal in all cases? aka, with Group Loot / Masterlooter, are they on the boss to be rolled for, or personal.. similar to a legendary? So, lets talk about this item. It was added November 8th hotfixes. Drops from LFR, Normal, Heroic, Mythic. The item is the same as old 'vanity' shoulder items. Much like, Mantle of the Eredar Lord in Warlord of Draenor, and Tusks of Mannoroth in Mists of Pandaria, all 3 also have super rare drop rates. However, unlike Mantle of the Eredar Lord it has 3 green stats. Tusks of Mannoroth had 3 prismatic sockets, and 2 green stats. Also, it is confirmed bonus roll-able, and does drop from LFR according to oskar66613, he linked a screenshot from a GM saying so! Had two drop during the raid tonight, Makes me wonder just how common they are.. Tusks are rare af. Do these drop of LFR? These can drop along with other items FYI, had them drop a long with the neck. I have so many questions regarding this item. Does it drop in LFR? And normal? What is the drop chance? I've been farming Xavius on all difficulties ever since this was implemented and have not seen a single one drop, not just for me, but anybody in the raid. We're talking four kills each week for three weeks. So my guess is that it's relatively rare at worst. Edit: as of today, 11.01.2017, the shoulders have appeared in the Dungeon Journal loot list, and are only present in Heroic and Mythic difficulty. This likely means that they are not obtainable in Normal or LFR. Would like to see someone disprove this. Edit: as of 08.03.2017 I have finally obtained this item. Have been killing the boss on LFR, Normal, Heroic and Mythic weekly on farm-mode since the release + spending all bonus rolls on HC and Mythic, and have exclusively seen them drop on Heroic and Mythic for anyone in the raid, meaning that their absence from the normal/LFR loot table is likely justified. I have obtained those shoulders last night from HC Xavius, however when I try to transmog them on my other leather wearing characters they do not appear in item list, not sure if it's a bug or it should be that way either way it makes me sad a little cos I wanted my tauren druid to have them but obviously cant. After relogging my characters several times, shoulders have appeared on the list and I can finally make my druid look badass, if any of you folks encounter same problem just relog your characters till it's fine. Can also confirm that they are bonusrollable and dropps in Mythic difficultly. Can confirm drop on Mythic difficulty, the loot was set on personal, I got it along with regular loot. The shoulders had gem on them as well. I would be pleased if someone could confirm here that they received the drop from LFR. A GM saying they drop on any difficulty is not a guarantee despite they planning it to be so. I remember Mists of Pandaria world boss mounts didnt drop for a few months for anyone before they were hotfixed. Struggling to find a good mog to go with these, any ideas? These are now in the dungeon journal loot table. So in my effort to get the Legendary Rogue shoulders I spent 5k Nethershards to buy the Relinquished Spaulders in The Broken Shore. These dropped from them. Not sure it's been mentioned before and apologies if it has and I'm sure I got very lucky, but it's clearly a possible method of obtaining them and might be worth looking at for those of you getting frustrated with the low droprate. Attached a screenie of my character below for proof. Ok...so a GM confirmed that these can drop from LFR and normal. There are lfr versions listed, has anyone ever seen them drop in lfr for anyone? I questioned a GM about these and this was the answer. "Now, I can confirm that the item can be awarded from the relinquished tokens. As for LFR and normal modes , the item is not currently dropping. In the past it is possible that inversely that item might have dropped there, but that was changed." Can anyone confirm if these shoulders are still available from 7.3 via Heroic Xavius or Relinquished Tokens? I made a ticket asking whether these shoulderpads drop from the new relinquished tokens on Argus and unfortunately, the answer from the GM wasn't 100% clear however I do have some positive news shared by the GM. According to him, there is no way for GMs to 100% check loot tables however, it is likely that they still drop as the majority of items in the relinquished tokens are the same as the Broken Shore but with higher item levels. This means that it is likely that the shoulders still drop from the relinquished tokens but there is a chance they were removed. I was also told that with time, the drop rate will lower even more and become less likely of a drop due to the loot table of these relinquished tokens being updated due to the new patch. Finally... after well over 100k Nethershards (probably closer to 200k), loads of Heroic and Mythic Emerald Nightmare runs and over 10k Veiled Argunite, I managed to get my hands on The First Satyr's Shoulders. I have submitted a screenshot with evidence to prove that I got it from one of the new Relinquished Tokens that require Veiled Argunite, and this proves that they do still drop. Was it worth missing out on some awesome 940 trinkets such as Unstable Arcanocrystal? Probably not. Something weird happened on the patch 7.3.5. This shoulder vanished from all the transmogs i saved and applied. All my toons logged with the appearance of the shoulder they were wearing, not the First Satyr. I needed to find it, save it and apply it again. Did this happen with somebody else? The disappearance of this shoulder is on https://www.wowhead.com/news=280717/patch-7-3-5-undocumented-changes. Its a known bug that Blizzard is working on. It's being looked into. As ever, please be sure to add or create a new report in our Bug Report forums for any other issues you might come across. Ty!" Hey guys! Just wanted to mention that there seems to be an issue since patch 7.3.5 that causes The First Satyr's Spaulders (and some other items) to disappear from players' appearance collections. Our developers are already working on it, trying to fix it as soon as possible. I can confirm too that it can be dropped from relinquished shoulders. Was farming! Im very happy! Is this just as rare as shoulders from Garrosh in SoO? Can it still drop from Relinquished Spaulders after Patch 8.0.1? Got these last night from a relinquished token after around a year of buying them along with xavius kills on 4 characters. Got these last night from a relinquished token after around a year of buying them along with weekly xavius kills on 4 characters. As a skeptic, never seeing hard evidence, I can confirm this is obtainable through bonus roll. Here is a screenshot as proof after looting Xavius on mythic difficulty. The First Satyr's Spaulders drop from Xavius only on Heroic and Mythic difficulties. These shoulders are very rare and you can get them via personal loot, but you can also coin them with a Seal of Broken Fate. You can also get The First Satyr's Spaulders from Relinquished Spaulders. Regarding the bug introduced in 7.3.5 - relevant blue post, that is, looting the spaulders but their appearance is not available to your leather-wearing alts. - Spaulders are now available to transmogrify! 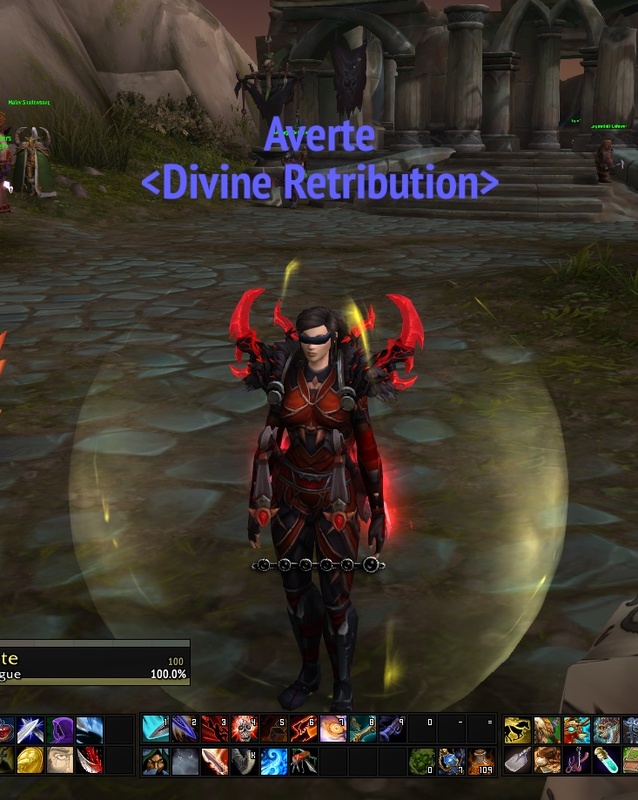 Not really sure what went wrong there, it could be that server-side the "discover and update new transmog appearances from what you're currently wearing" event as soon as the character logs in. In any case, I am now a happier druid/monk/rogue and demon hunter.